Cats are one of the two most popular pets in most Western countries, the other being dogs. No wonder that many countries have a National Cat Day. 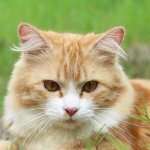 National Cat Day is celebrated on October 29 in the United States, on February 22 in Japan, on March 1 in Russia, and these are just a few examples. Of course, there’s also International Cat Day that was created by the International Fund for Animal Welfare. The International Fund for Animal Welfare was founded by a small group of people in 1969, to stop the commercial hunt for seal pups in Canada. Over the years, its range of activities has expanded significantly and now includes helping cats and gods in impoverished communities. That’s why one of the main goals of International Cat Day is to raise public awareness of the problem of homeless animals. On International Cat Day, some veterinary clinics provide free care to homeless cats, and shelters organize special events to encourage adoption, helping as many cats and kittens as possible to find a loving family. If you don’t have a cat but you’ve been thinking of getting one, International Cat Day is a perfect occasion to adopt a companion. And if you’re already a proud cat owner, celebrate the day with buying a new toy or a treat for your pet.